a. To demand the immediate and thorough cessation of all acts of violence and the killing of Syrian civilians that are totally unjustified, irrespective of their motives. b. To call on the Syrian armed forces to immediately lift the military siege clamped on residential neighborhoods and villages, refrain from shelling or storming residential areas, return the army and its mechanized armor to barracks and to their original positions, and hold Syrian authorities responsible for the protection of civilians. c. To reiterate the request for a full commitment to preceding Arab League resolutions, the last being Resolution 7444 dated January 22, 2012, concerning the roadmap to the peaceful resolution of the Syrian crisis. To also urge the Syrian government to fulfill its commitments and cooperate, seriously and expeditiously, with Arab efforts to find a peaceful denouement to the Syrian crisis that would preclude the risks of military intervention. d. To end all forms of diplomatic cooperation with Syrian regime representatives (accredited to) foreign lands, organizations and international forums and to invite all nations eager to spare Syrian lives to follow the Arab states’ suit. 2. To deem the use of violence against Syrian civilians, particularly women and children, as pertinent to International Criminal Law and warranting punishment of the perpetrators. 3. To confirm keeping in place the Council’s economic and commercial boycott of the Syrian regime, save for measures liable to affect Syrian citizens directly. 4. To terminate the Arab League observer mission that was set up in the protocol signed by the Syrian government and the Arab League Secretariat on December 19, 2011. 5. To call on the UN Security Council to pass a resolution setting up a joint Arab-UN peacekeeping force to oversee implementation of the ceasefire. 6. To request the Arab caucus at the United Nations to submit as soon as possible a draft resolution to the General Assembly focusing on the Arab initiative and other pertinent League resolutions. 7. 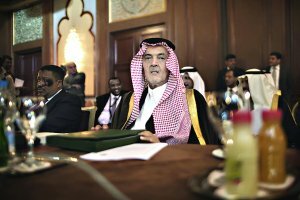 To request the (League’s) Secretary-General to name the special envoy to follow through the political process proposed in the framework of the Arab initiative as per the fifth paragraph of the Council of Ministers’ Resolution 7444 dated January 22, 2012. 8. To welcome the Tunisian Republic’s offer to host the “Friends of Syria” conference slated for February 24, 2012, underscoring the importance of the Arab states’ participation in the said conference. 9. To open channels of communication with the Syrian opposition, provide it with all forms of political and material support and urge it to close ranks and engage in a serious interchange that would safeguard its cohesion and efficacy ahead of the Tunis conference. 10. To open the way for Arab and international relief organizations, including the Organization of Arab Red Crescent and Red Cross Societies, the Arab Physicians’ Union, Médecins Sans Frontières and other organizations to deliver relief and humanitarian assistance to Syrian citizens. 11. To call for “crowd funding” campaigns to collect ordinary people’s contributions to help brotherly Syrians and alleviate their suffering. 12. To devise an Arab mechanism to solicit and forward humanitarian aid to the brotherly Syrian people. 13. To urge the Organization of Islamic Cooperation to support the international endeavor regarding Syria. 14. To remain in session and matter seized of the pending new developments.